Enlighted has a smart light technology using sensors and software to control office lighting, reduce energy use and improve worker productivity gaining acceptance among building owners. Enlighted puts sensors into lighting fixtures that can monitor the energy use, temperature and brightness in a room. The sensors also can detective the number of people in a given space. 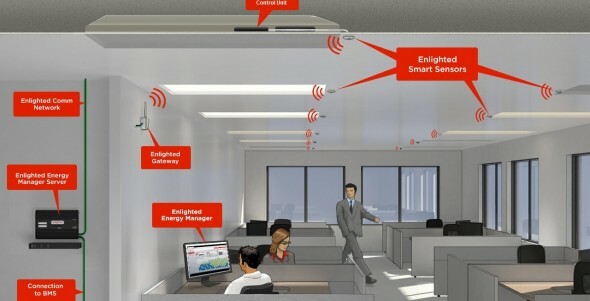 By wirelessly connecting the lights, a computer with Enlighted software can adjust the brightness of the light for each cubicle and automatically lower or cut off the amount of electricity going to the lights at different times of the day. What’s new is the greater level of sensitivity from the sensors and the lighting control, as well as the collection and crunching of energy consumption and other data over time to further fine-tune that control and hopefully reap more savings. The emergence of LED lighting is helping to promote more sophisticated lighting control technologies. LED chips are made with semiconductors and are digital, which makes them a good companion for sensors, which also are made with semiconductor such as silicon. You can put the sensors next to the LED chips inside light bulbs. LED lighting , though more efficient and provides a greater energy savings over time, is more expensive and requires a greater upfront investments from commercial building owners. Enlighted’s technology works with florescent lights, too, and many of Enlighted customers are opting for florescent lighting at this point.